My bet on Article 50 not being "triggered before July 2017" is now well in the money, trading in an illiquid market at around evens now (last trade was at 2.02). I still think this is a value price, since effectively this bet becomes settled at the end of March 2017, a mere eight months away. Once this date passes, leaving the EU will become a QMV (qualified majority voting) issue, which in simple terms mean that Article 50 will need the support of 14 other countries. In the European Union, double majority voting is a form of Qualified Majority Voting which is to apply to almost all policy areas starting in 2014 under the Treaty of Lisbon. Any decision taken under this scheme will require the support of at least 55% of the Council of the European Union members who must also represent at least 65% of the EU's citizens. Make of it what you will, but I am not seeing anything that makes me think Article 50 is likely to be triggered any time soon. Certainly Article 50 could be triggered after March 2017 and before July 2017, and fail to reach a majority in the EU parliament, which would make the bet a losing one, albeit with a positive outcome from a personal point of view - an insurance bet perhaps. But would the UK trigger Article 50 knowing that they lacked the votes to see it through the EU parliament? Possibly, to appease the Leave voters - "hey, we tried lads, sorry it didn't work out", but by that time the advisory referendum will be close to a year old, and advisory referenda surely have sell-by / expiry dates as more information becomes available. 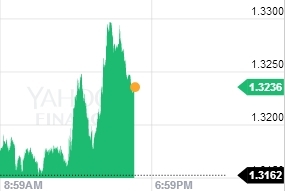 My cautious optimism that Brexit will never happen is tempered by the failure of the pound to make much of a post-advisory referendum bounce although today is a step in the right direction. The result of the advisory non-legally binding EU referendum was a topic of conversation that came up often, and I was pleased to see that the prices on my bets on Article 50 not being triggered before July 2017 (at 2.3) and not being triggered in 2016 (at 1.5) have both shortened (the latter considerably to 1.07, with time running out) and appear to be some validation at least that how I felt this whole mess would play out might not be too far off the mark. If the Britons who powered Brexit to victory were Americans, they'd look a lot like Donald Trump voters. Both camps are fueled by older, working-class whites spurred by nationalism and nostalgia for a bygone era. Their economic prospects have diminished in an era of globalization, and they feel that immigration is damaging their pocketbooks and their cultural identity. And they think the elites aren't listening. "They're frighteningly close," said Mary Nugent, a doctoral candidate who teaches U.K. politics at Rutgers University. "The demographic breakdown is also similar in that overwhelmingly lower-educated and lower-income people voted for Brexit. That's true of Trump supporters as well. It's an expression of disaffected, mostly white voters and an expression of the feeling of not being heard." Scary times when Trump is considered to have about the same chance of becoming the next US President as Middlesbrough do of being relegated. In other news, Geoff has finally been sent the long-promised document containing a number of the systems I mention in this blog from time to time, and in plenty of time for the Bundeslayga systems which start on 5th August as well as the post-season MLB coming ever closer. I didn't include the Lay Last Loser system as I have only followed this for one season, but I'll report back on how this performed in 2016-17 later. The Bundeslyga had its worst results last season, +1.76 points from 167 selections (ROI 1.05%) compared with +29.7 points from 594 selections over the previous three seasons, and an ROI of 5%. Selections were significantly down last season from an average of 198. A rather bizarre push occurred this weekend in my MLB Home Improvement system when the Chicago White Sox were a selection versus the Detroit Tigers. Unfortunately, the listed starting pitcher Chris Sale appears to have had something of a tantrum pre-game over wearing throwback jerseys, and was suspended and replaced, thus voiding my bets. The second selection of the weekend (Toronto Blue Jays) fared better as they won both on the money line and run line. A pleasing end to the Euro 2016 tournament, where the strategy of backing Half-Time 0:0 (HT0), Full-Time Draw (FTX) and Under 2.5 (U2.5) in knock-out matches finished with a grand-slam home run. The implied odds on these outcomes since the Euros went to a 16 team format in 1996 are 2.08, 2.38, and 1.56 respectively. While the Unders prices do seem to pretty much be in line with overall expectations (1.52 for the final), the draw and HT0 were available at 3.15 and 2.3 for the final. These tournaments have two distinct parts, the league (group) stage and the cup (knock-out) stage, and in my opinion, due to the differences in context, the data needs to be kept discrete. In Group stages since 1996, the implied odds on the above outcomes are 2.64, 4.1 and 1.75 respectively. This year’s Group stages saw an upswing in all three outcomes, HT0 jumped from 35% to 47%, FTX from 22.5% to 30.5% and U2.5 from 53% to 69%. A prime suspect is the 24 team format, which is less than satisfactory with its ‘best four third-placed finishers' feature meaning that teams have no incentive to take risks, a strategy for which Portugal were ultimately rewarded. The only other major tournament with this format, and with 3 points for the win, was the 1994 World Cup when Group 3rd placed Italy also made it to the final before losing a 0:0 draw on penalties. So with the 2015-16 football season finally at an end, the 2016-17 season has already begun and if you’ll excuse me, the author of your favourite blog will very shortly be taking a well-deserved break from his blogging duties and jetting off to the city of brotherly love and, as my son puts it, “travelling 3,500 miles plus for a meaningless friendly, to watch a team with half the squad missing”. I’ve not been to this part of the States before, (Palace played there in 2014 winning 1:0, but I didn't make that one) and apart from seeing the Liberty Bell, I do have family in the area including some second, third, fourth (possibly up to tenth) cousins, removed so many times that I’m not sure they are still part of my family tree, although I am assured by Ancestry.co.uk that they are. My father’s cousin, in his eighties, and now living in Baltimore, mentioned to me that he would quite like to see Crystal Palace again, and that his last game in person was a Third Division South encounter prior to emigrating to the US in the 1950s. A few things have changed since then, not least the club going from re-election applicants in 1956 to established Premier League giants a mere 60 years later. Almost unbelievable numbers really, and of course, that’s exactly what they are. We won't ask (yet) what happened to 2011, but the numbers are conspicuous by their absence. As you might have guessed. the results record doesn’t relate to individual games, but to sequences of bets. It’s a different spin on the Sports Betting Professor aka Rich Allen’s system that was discussed in this blog back in 2010. Try this system with the roulette wheel some time. Wait for black to come up three times, and then bet on red (or vice-versa or use any of the ‘even’ money plays). The chances of that first bet losing (making it four blacks in a row) are just one in 16 and it’s one in 32 that it could lose twice in a row, except that of course it isn’t. The chances of that first bet losing are always 1 in 2 (we’ll ignore the zero to keep things simple). To recover your loss, you need to double up on bet #2, which also has a 1 in 2 chance of losing. And soon you are betting big money to make a tiny profit. An additional problem with sports betting is that you will often not be getting even money, so if the next selection in your sequence is odds-on, you are required to more than double your stake. The system I stumbled across is a “Shut Out” system – if a team is shut-out (fails to score) then you bet against them until they lose again, or if a team shuts-out an opponent, you back them until they win again. In theory it all sounds wonderful; in practice, not so much. If laying a team after they have been shut-out or backing one after shutting out another are profitable strategies, there would be no need for fancy staking methods. Over the past 5 seasons, laying a team shut-out in its previous game would have lost you 32.27 points (-1.8% ROI), while backing a team who inflicted a shut-out in its previous game would have lost 50.37 points (-2.2% ROI). I'm not seeing an edge here. but the feat was matched by four other teams and the San Francisco Giants have already done it this season. Presumably there are other conditions to be bet, but the hazards of such a system should be apparent. When I started this post, I had no desire to know the exact system, but at this point, curiosity has got the better of me. The best clue is surely the one loss reported in 2014, a season when there were two cases of a team being shut-out but then winning at least six matches. In July, the Los Angeles Angels were having a great season with a record of 52-36 before being shut-out at home to the Toronto Blue Jays. Earlier in the season, much earlier, the Milwaukee Brewers were shut-out in the third game of the season, with a 1-1 record, and then won no less than nine on the run. My suspicion is that there is another condition which is that the team can't have a winning record at the time of the shut-out. It makes sense - only a fool would bet against a team with a record of 52-36 - but the system creator really needs to add a 'minimum number of games' condition in my opinion. 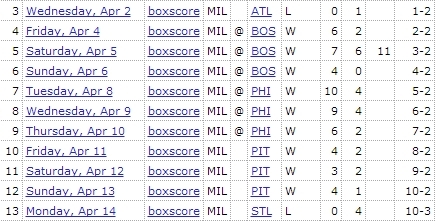 To check this theory further, I took a look at the 2011 (missing) record, and found two 6-game winning sequences subsequent to a shut-out - and again one was the Brewers, the other the San Francisco Giants. The Brewers were 21-23 after their shut-out, before their winning streak, while the Giants were 75-70 before theirs. No wonder the records for 2011 are missing! As for the stakes you'd have been losing during those streaks, for the Baltimore Orioles they were 1.95, 1.95, 2.65, 2.7, 2.0, and 1.95 for their next six. Suspecting now that the 2014 loss might not have been that early season sequence for the Brewers, I looked at the records for teams handing out a shut-out and then losing the next six or more. We can't get away from these Brewers because later in the season with a 52-26 record (seen that somewhere before as well) they lost 7 in a row. 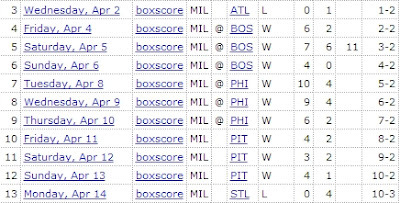 Since we can't trust the published records, I'll leave it there, but I did see the Braves also had a winning record that year, and has two losing runs of 6+ following a shut-out win. Hopefully readers get the point that while we may not know exactly what the criteria are, the method is flawed. Well that was fun. When I'm on my death bed, I have no doubt that I'll regret not spending more time on this. Although these so-called systems are usually always scams, (a record of 113 – 0 is much sexier than one with 150 bets a year with an ROI of 2%) reading them can often trigger some ideas. Why should a condition be the shut-out? It’s an easy number to see, but maybe a little more effort would be worthwhile. An unlikely scenario admittedly, but in theory a team could be shut-out after loading the bases in each of the nine (or more) innings. Conversely, a team could avoid a shut-out by scoring one run off an error. Which team would you rather be backing in their next game? Put in a little effort, i.e look at more than just runs scored and conceded, and you might just find an edge you can profit from. The creator of the original T-Bone System, I'll call it T-Bone Raw, was very excited about the outcome of backing Overs as an additional revenue stream alongside the Money Line and Run Line returns. Personally, not keen on the Overs here - all the profit seems, I think a bit strangely, to come from when the total has been set high - in direct contrast to the earlier years when overs did better on low total lines.Quite a change round that I cannot get my head around. He's not the only one. 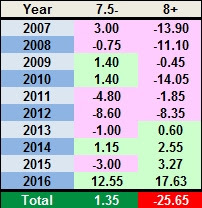 What Tony has noticed is that over the last ten seasons, backing Overs with this System fared better when the Total was low from 2007-2010 but since then has performed better when the Total is higher. This wouldn't be so odd if the number of runs being scored was on the increase, but they have steadily declined from an average of 4.8 per game in 2007 to 4.07 in 2014 with only one blip in that sequence which was an increase in 2012 to 4.32 from the previous season's 4.28. However, we are now on the up again - in 2015 there were 4.25 runs per game and currently this season we are sitting on 4.51. We're only a little over half-way through this season, but if the 4.51 number holds, that would represent an increase of 10.81% in two seasons. 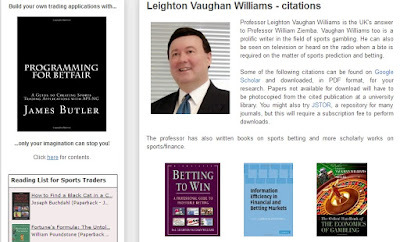 Have the sportsbooks been caught off-guard? Forgetting all about T-Bone for a moment, it's interesting to see that Overs performing better against higher totals isn't just true against a subset of Raw T-Bone games. Had you blindly backed Overs this season in all games, then in games where the total was 7.5 or less you would be down 55.21 points, but on lines where the total is 8 or more, you'd be laughing all the way to the bank +54.75 points! That is quite a discrepancy and the sportsbooks (overall) have it about right, as usual. The 'overall' is key though. The temperature is lower, which tends to suppress scoring by reducing batted-ball speed and distance and, by extension, BABIP and home run rate. On the other hand, the hitters are “ahead” of the pitchers early in the year, which tends to inflate scoring by giving batters more favorable walk and strikeout rates. The net effect is that April scoring tends to be slightly higher than the full-season rate. Tony also pointed out that since 2012, in terms of T-Bone wins, the prize (a box of T-Bones perhaps) goes to our old friend Clayton Kershaw with 16 from 22 starts, and that 20 of the 30 teams have qualifies as a T-Bone pick in that time - the one exception? Minnesota Twins. Not a surprise that this season, it is the Cubs leading the way with 12 selections. which neatly ties together my recent reference to the death penalty and the recent non-legally binding referendum. 71% of those in favour of the death penalty indicated that they would vote to leave the EU, while only 20% of those opposed to capital punishment indicated they would vote to leave. The full article by Eric Kaufmann (@epkaufm) can be found here and it’s a well researched article and worth a read. I hope the author's accreditations are acceptable to readers – Professor of Politics, ice-hockey player, Dad. I've been thinking more about the T-Bone MLB System I mentioned recently, and how illogical the parameter 'coming off a loss' should be, and perhaps even more illogical when the loss may well have been against a different team. For 2016, the official T-Bone record Straight Up (SU) is 49-16, +22.21 points with an ROI of 20.3%, which is quite impressive, but how does this compare with the results ignoring the 'coming off a loss'? The SU record would now be 110-49, +27.73 points, ROI of 10.3%. I'll try to find time to look at previous seasons, although Geoff has been patiently waiting for me to complete my document detailing some of my strategies, so I may do that first. The recent increase in hits on this blog (343 a day over the past fortnight) may or may not be related to its temporary interest in politics and political betting, (if Betfair can include Politics under Sports, then surely so can I – although Blood Sports might be more accurate), but it appears the esteemed Professor Leighton Vaughan Williams (Economics Professor and editor of my imminent summer holiday reading Information Efficiency in Financial and Betting Markets) may be a visitor. 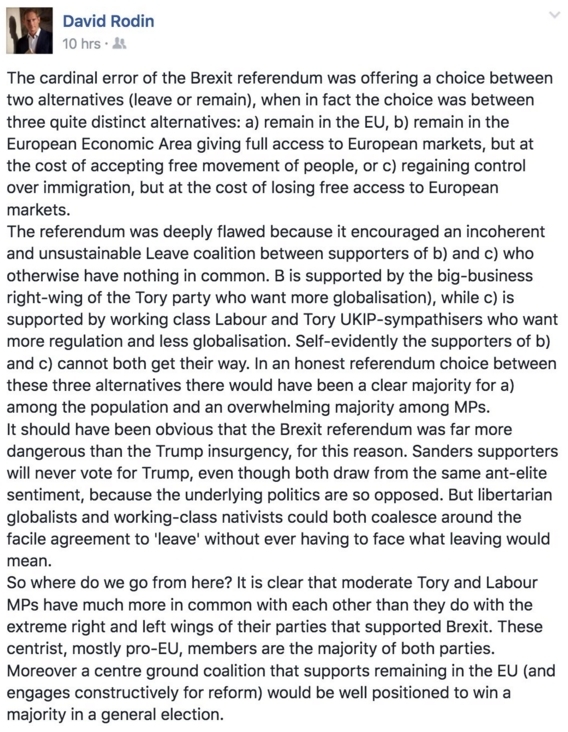 Having explained my thinking in that earlier post regarding whether or not Brexit will ever happen, and having put my money where my mouth and betting that Article 50 will neither be triggered in 2016 nor before July 2017, I really was hoping that I would hear opposing views as to how, and specifically under what circumstances, others can envisage this event happening, and taking it one step further, if Article 50 is not invoked by the end of 2016, when and how might this momentous event happen? "Not triggered before July 2017" is currently trading at ~2.22. Is this a value bet? I wonder which is exploring the depths faster, Sterling or the rabid left that appears to have hacked into this former sports betting blog? Gold is up against all currencies. Surely that can't be true if only the UK is to be punished for its folly. Still, with my bullion holding, as Liberace once said, "I cried all the way to the bank." If the original author of this blog is still around then I wish him well whilst he passes through his mid-life crisis. Green All Over has turned into Red Faced All Over with the standard of research and biased use of quotes in recent weeks. It is now very hard to keep a straight face whilst reading this blog. Stick to 'Musings on Backing, Laying, Trading, Punting, In-Running and more on the Betting Exchanges (Betfair, BETDAQ) and related items of interest in the wide world of sports investing since 2008. This is NOT a P&L blog. "' and all will return to normal. And finally, thanks for sending all your bored readers over to my website. My viewer stats have gone through the roof! Comments are always welcome, so long as they are polite, but as wordy as it was, I’m not seeing any evidence or even ideas presented to contradict any of my facts or how my standard of research is lacking. 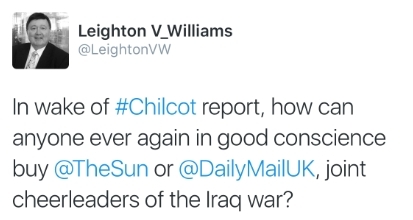 If publications such as the Financial Times, The Independent, The Guardian, The Economist, Business Insider, HM Revenue and Customs, New Economics Foundation, Professor Leighton V Williams, David Rodin, Robert Peston et al are considered ‘lacking’, then we have a conspiracy theorist in our midst, and I’m really not sure what sources would be acceptable. Bob the Builder, Postman Pat, or perhaps The Sun or Daily Mail? Screenshots showing the decline of sterling or the standing of various indices post-the non-legally binding referendum results are facts / reporting, not opinions / scaremongering, and facts are just that, regardless of one’s political leanings. Believing something is true because you’d like it to be true has no bearing whatsoever on whether it’s actually true. James’ reference to the non-legally binding referendum’s result as ”folly” (definition : lack of good sense; foolishness) is interesting though - a slip revealing that he really is just being mischievous and playing devil’s advocate to attract more visitors to his blog. Apparently it’s working, which is to the benefit of all us sports (which includes politics) investing bloggers. Blog hits are not a zero sum game, and incidentally, the rise in the value of gold is because of the political and economic uncertainty. 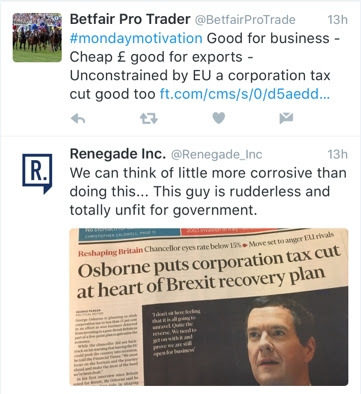 The UK is not being "punished for its folly" - it's market forces reacting. The mention that "It is now very hard to keep a straight face whilst reading this blog", is particularly appreciated. I sometimes think some of my more subtle jokes and references get completely missed, but apparently not always, and it's good to know that the extra effort made in recent posts to maintain my sense of humour has not been wasted. Continuing on a lighter note, and I couldn’t believe how long it took me at work to explain to one of my team that Roger Federer is not the oldest player to reach a Wimbledon semi-final, as he rather loudly claimed. I told him that Ken Rosewall was older, and after some research, he came back to tell me “… but Rosewall reached the Final, not the semi-final”. What an unforced error! Hard to reach the final without going through the semi-final (at least since 1922 anyway), and harder than I thought it would be to get that point across. With mid-year reviews upon us, it’ll be hard to prevent that exchange from influencing my assessment. 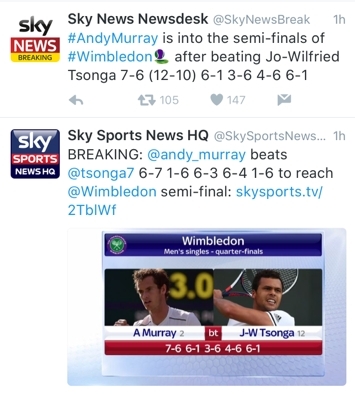 And while we are on the topic of tennis, is it only me who finds it very annoying when a result is given backwards? The first Tweet from Sky News Newsdesk is correct. The second Tweet from sibling Sky Sports News HQ annoyingly has it wrong in the text, but correct in the image below it. Andy Murray did not win 6-7, 1-6, 6-3, 6-4, 1-6. It's like saying Portugal beat Wales 0-2. 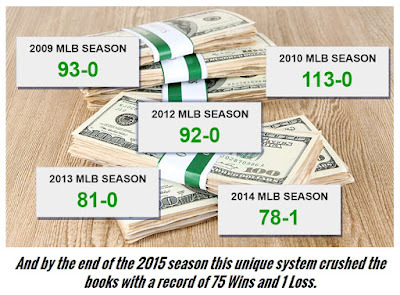 I've found a system for MLB that plays only favorites. The favorites have to be -140 or better to qualify. Betting on favorites at those numbers is very risky business and almost certainly doomed to fail but not all those teams will qualify as a play and it's hard to argue with the results. 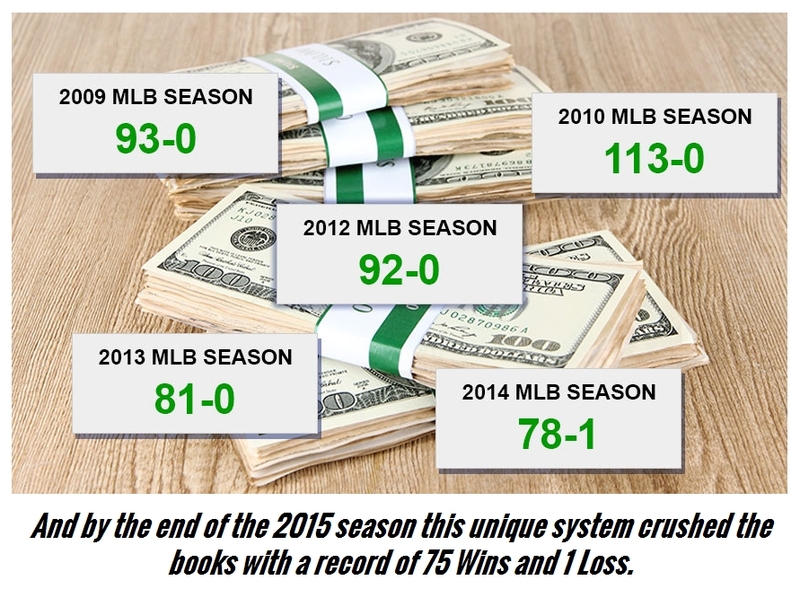 This system has been profitable when playing on the Moneyline, Runline, and the Ov since 2014. While the poster (T Bone) declined to detail what the selection criteria were, he gave a few clues in subsequent posts, and it is clear that the system is based on road favourites coming off a loss. 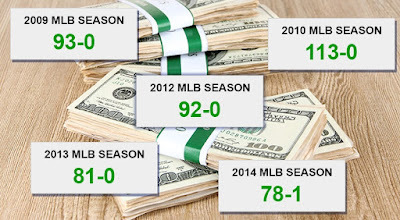 Readers of this blog will know that following MLB favourites is a profitable strategy these days, (e.g. since 2011, straight up at 1.71 or less is +1,14.38 points) but the 'coming off a loss' angle was new, and the trend towards Overs was new too. Why should the Overs be value all of a sudden? 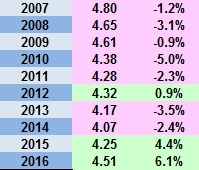 The claim of profitability is verified, although 2015 was actually a losing season with all bets combined, but 2012-2014 were solid enough, although the Overs were losers until now. This season it's a different story, and the 76.3% strike rate for Overs after 65 games to date is frankly ridiculous and surely can't last. 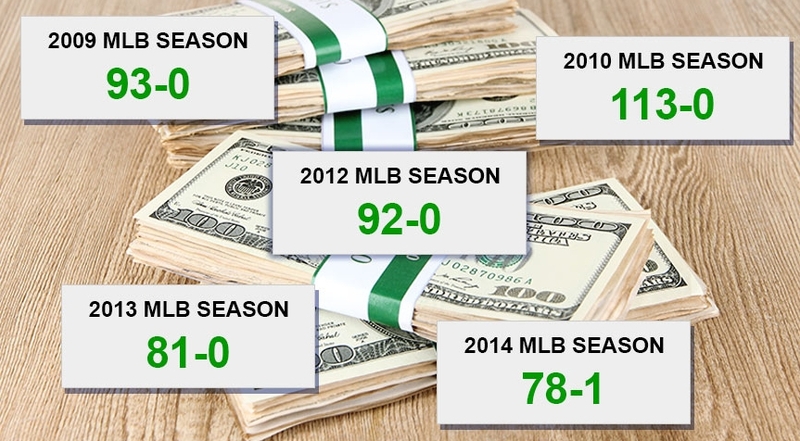 It's only this season's profits that have put Overs into the green, but the results on the Money and Run Line bets are both very solid over the past five seasons. I've added this system into my portfolio and named it T-Bone, (I can cope with an average of under one bet a day), and will try to remember to update results each month. And on a personal note, the hit counter for this blog has now ticked past the 1.25 million mark. Thank you, and keep reading. Whilst "the non-legally binding referendum" is just that I would not want to be an MP that stood in its way. Otherwise, the next general election will be pretty gruesome for the establishment. 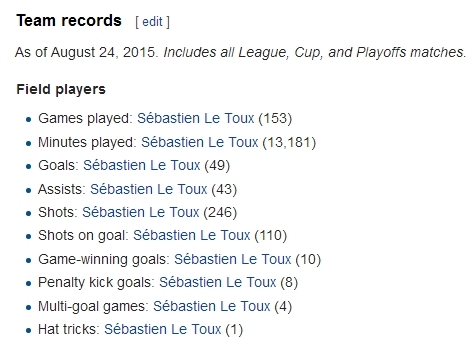 Your sports data research is very good. I certainly can’t argue with James’ closing comment there, but only time will tell who is right on whether or not Brexit ever happens. 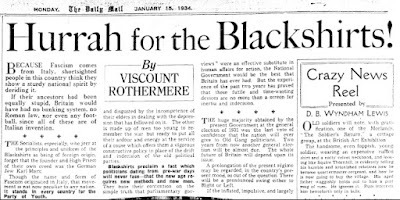 Some of us are old enough to remember the debate over the death penalty in the UK in the 1960s. The overwhelming opinion among the public was favourable towards capital punishment, but fortunately their representatives in parliament held a more enlightened view, and the death penalty was abolished and subsequent moves to restore it were dismissed. Capital punishment has long been an issue over which Parliament and the public were at odds. In 1965, a year after the last executions in the UK, MPs voted 200 to 98 to suspend the death penalty for murder, even though opinion polls suggested the vast majority of electors wanted it kept on the statute books. The death penalty is a non-issue these days and a relevant example of why we elect MPs as our representatives, rather than have a direct vote on matters of such importance. As the referendum results were not announced according to Westminster constituencies, but by local authority area, MPs can’t be certain of their constituents views anyway, although most would have a good idea, certainly those in Scotland. But views change as facts and evidence are uncovered or reveal themselves. In the same way that no thinking person these days considers the death penalty to be a good idea, already opinions are changing over the European Union, and we are less than two weeks on from it. As the dust settles and more information becomes available, opinions change, (or should), and the new information coming to the surface since the Referendum is all to the benefit of the Remain side. The Independent claimed on June 27th (just three days after the result was known) that one million people want to change their vote from Leave to Remain. That’s comfortably more than the 634,751 which would be enough to swing the vote the other way, and who would doubt that were a second referendum to be held tomorrow, the Remain side would not win comfortably? Whatever the number regretting their Leave votes last month, it is likely even higher now for a number of reasons - the departures of Boris Johnson and Nigel Farage, the evaporation of campaign promises, the realization that the Leave side have no realistic plan for how to proceed, the loss of our AAA credit rating, the collapse in the value of the pound ($1.2792 now! ), the loss of investment and jobs already being reported, the reduced influence of London in financial markets and of the UK’s in the world, plus the rise in racist incidents being widely reported – just to name a few. And of course, Brexit hasn't created new racists, but what it has done is legitimise racism. If it wasn't such a serious topic, it would be amusing that the targets for much of this open racism are immigrants from the Empire, and nothing to do with the EU! So Members of Parliament would need to consider the views of their constituents at the time of the Article 50 vote, not on what their views may have been on one day back in June 2016. 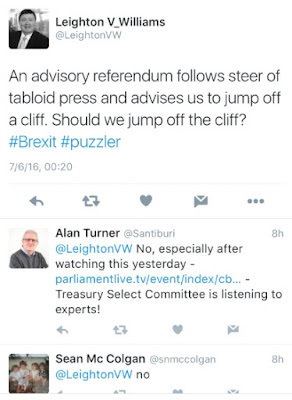 If you were an MP and the majority of your constituents were in favour of jumping off a cliff, would you…? Probably not – an MP is elected to make an informed decision for the benefit of constituents, and by extension the country. 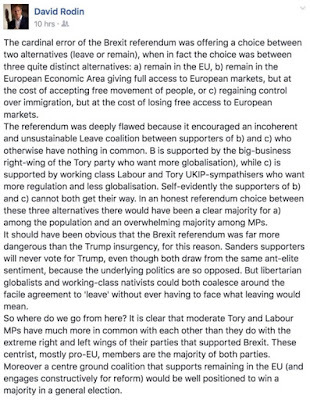 One of my old school friends [Daniel Zeichner] is an MP representing a Cambridge constituency, and he has made it quite clear that he will vote on Article 50 in the best interests of his constituency. I would hope that all, or at least the majority of MPs, would do likewise. The next General Election is (probably) four years away and while my answer when anyone asks me about the next election is always “I don’t know – I don’t have 2020 vision”, more seriously, the political landscape is likely to be much changed then. 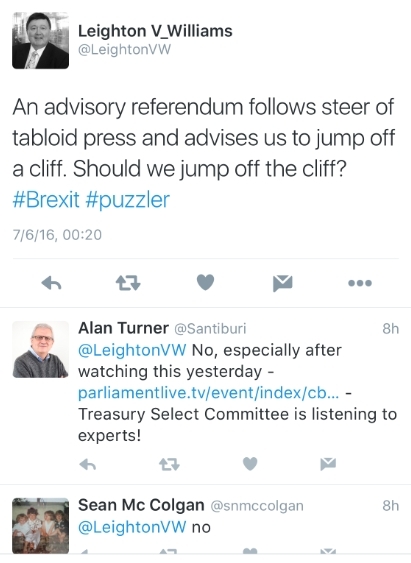 The FT’s David Allen Green had a good post yesterday detailing why Brexit may never happen. The established order in any society can sometimes be wrong-footed, but they are usually not wrong-footed for long. Genuine revolutionaries know this, and they act quickly to take full advantage of any temporary advantage. Soon, however, the established order will regroup and refocus, with renewed determination. The generally pro-EU political class in the United Kingdom has certainly had a fright. They were not expecting to lose the EU referendum. 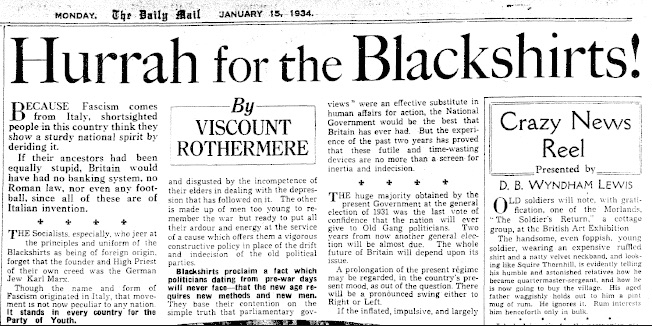 British political leaders were so confident of victory they even casually said that the people’s decision would be implemented “straight away”. And now there is a crisis, but only for a while. Unless a sincere Brexit campaigner wins the Conservative leadership election and becomes the next prime minister, the UK government can be expected to now take three steps to slow down the Brexit process in the hope (and perhaps expectation) that it does not happen. The first step has already happened: Mr Cameron snapped the tie between the referendum result and the Article 50 notification. The second step will be when the government says that the form of the decision will require some form of parliamentary vote: either a resolution or a motion, or even a fresh statute. Views vary among legal pundits on whether this is strictly necessary — my view is that it is not, and if the prime minister and cabinet had decided on referendum day to make an immediate notification, no court would have quashed the decision or injuncted him from making the notification. But it is a convenient view for a procrastinating government to adopt, and the result of any parliamentary vote cannot be taken for granted by leave supporters. Few members of parliament or peers support Brexit. The third step will be the proposal of preconditions before further action. Many will remember Gordon Brown’s “five tests” for UK to join the euro (which were never tests in any real sense, but that detail was not important). Already contenders for the Tory leadership, such as Theresa May, the home secretary, are talking of situations being right and that things will be done when they are good and ready. This vagueness will no doubt shortly convert into more formal terms. After all, this would only be what any responsible government would do before taking ever such an important action. None of this is to say Brexit is impossible – any pundit who claims an event will not happen will usually be wrong – but it certainly becomes less likely as time passes. And unless Leave create another moment of opportunity – another wrong-footing of the established order – so as to force through the required Article 50 notification, then it may not happen at all. It would be interesting to hear from James, or anyone else thinking that Brexit will happen, how and when they think it will happen. Although legal experts say that triggering Article 50 is a prerogative power, it’s surely highly unlikely that a PM would pull the trigger on such a momentous and far-reaching decision without a vote in parliament. It would be a brave person who would go this route alone, as evidenced by the embarrassingly hasty departures of two of the most prominent Leavers, and would be almost guaranteed political suicide. It would be far more sensible, both politically and tactically (a strengthened negotiating position), to obtain parliament’s approval first, and while James thinks that approval is more likely than not, I disagree. The longer the delay, the less chance that Brexit will happen, in my opinion. The battle may have been lost, but the war is far from over. So just when will Article 50 be triggered and who / what party would be reckless enough to really do it? Will a pro-Brexit Conservative Leader become Prime Minister and trigger it? Will a pro-Remain Prime Minister trigger it? Will there be a General Election either in 2020 or before with a party running under a Brexit flag winning an Overall Majority and triggering it? Or will there be delays, and “tests” and vagueness as Mr. Green suggests above, until the wind is taken out of the rudderless Leave campaign’s sails, the country breathes a collective sigh of relief, and we all move on with our lives hoping that the rest of Europe don’t tease us too much for our momentary lapse in good judgement – it is National Stand Up To Bullying Day after all. I’ve never thought much of David Cameron, but he made the right move for the country when he delayed invoking Article 50, and in years to come he will be viewed favourably on that decision at least. Perhaps he didn't want his legacy to be breaking up the UK and the EU. Of course it was his short-sighted decision to allow a referendum which has brought about this mess in the first place. While the non-legally binding referendum result continues to weigh heavily on the country's future, an additional correlation factor has been found to join those of age, education / class and race / religion. Age - Those aged over 60 were the most likely group to want to leave the EU. Race / Religion - Areas with high immigration wanted to stay in the EU. 58 per cent of Christians backed Leave. 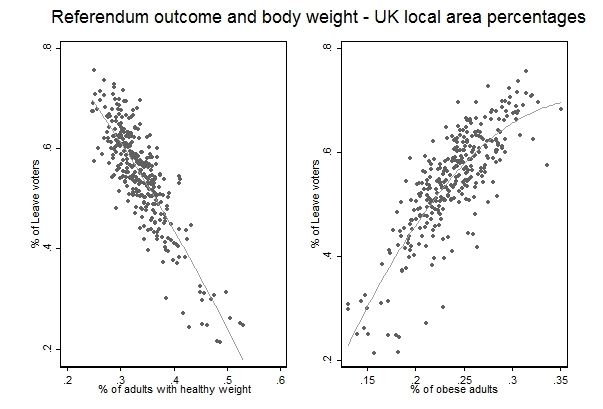 It does indeed appear that high proportions of Leave votes are associated with high proportions of obese adults. Looking at all 326 districts the correlation between the % of obese adults in a district and the % of Leave votes is high, with a correlation coefficient of 0.8 (0 implying no correlation and 1 perfect correlation). Despite what some sensationalist sources appear to highlight, this blog does not make claims about the physical attributes of Leave voters. It focuses on geographical areas (!) and not individuals, and identifies an interesting correlation – not necessarily causation. 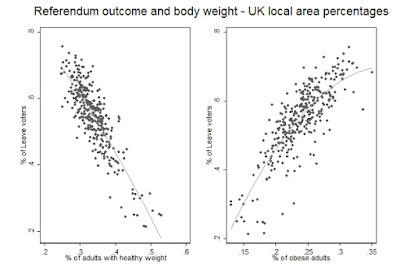 When I said that areas with high obesity rates are typically areas with high Leave vote rates, to most people it means all areas with high obesity rates voted leave. This should not have surprised me. As an economist dealing with lawyers, I have noted this many times in the past, but it had never struck me with such intensity. I largely underestimated the power of availability heuristics: people rate personal anecdotal evidence higher than distant data-based evidence. “It didn’t happen to me so it cannot be true.” Again, this is something I had known, but I naively thought that sharing the data for replication would cancel this effect out. I can confirm, up to today nobody has downloaded the data I attached. We certainly shouldn't be mean about fat people; they have enough on their plate. My mother is a great example of the power of personal anecdotal evidence - you can give her all the statistics available, but if she hasn't personally experienced it, then they are worthless. 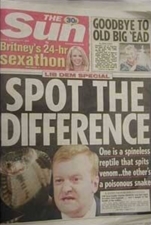 Unless they've been published in the Daily Mail of course. So if you voted Leave, and you're not old, uneducated, poor, Christian, self-servingly politically ambitious or fat - who are you? Britain’s 132 university vice-chancellors had come out 132-0 in favour of Remain, arguing that EU membership helped research collaboration and academic mobility, and allowed Britain to receive a net gain of £1 billion ($1.78bn) in EU research funding. Vice-chancellors must be slim atheists, and yes, many studies have found a correlation between higher intelligence and lower religiosity. The majority of FTSE 100 constituents are multinational companies that make a large proportion of their income overseas. As the pound drops in value, this income is worth more in the UK. To get a better indication of the UK economy, it is helpful to look at the FTSE 250, or the 250 biggest companies in the UK, which is more dependent on the UK economy than the multinational companies represented in the FTSE 100. 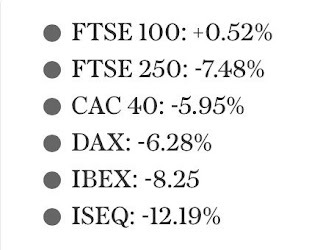 The FTSE 250 fell 13 per cent in two days after the vote came in. 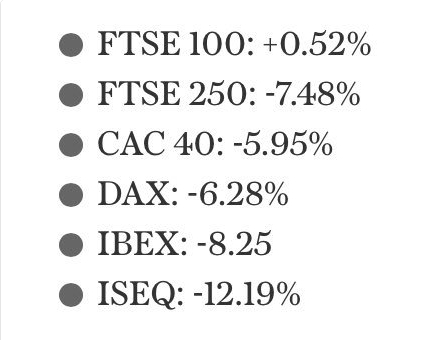 It has recovered a little since then, but not on the scale of the FTSE 100. By close on Friday it was trading at 16,465.49, some way off its pre-Brexit high of 17,333.51 on Thursday June 23. Confidence in domestic companies is low because the outlook for the UK economy doesn't look good. There's a much higher risk of recession, according to Standard & Poor's, who put the likelihood of recession in the next 12 months between 20 and 25 per cent, compared to 15 and 20 per cent in March. George Osborne, the Chancellor, has abandoned his target of reaching a budget surplus by 2020. That will come as a relief to those who believe greater public sector spending will be necessary to address the knock on effects of the slowing economy. 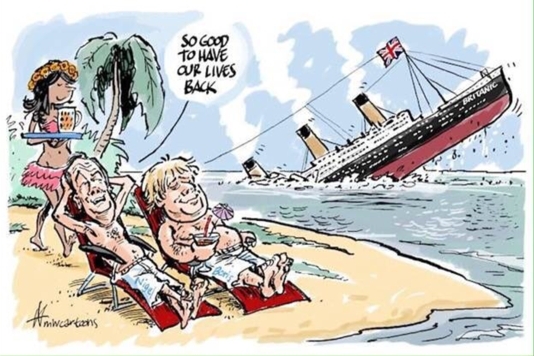 But it's another indication that the UK's economic recovery has been derailed by the vote to leave the EU, despite how things seem on the FTSE 100. There is no clear evidence that cutting corporation tax leads to improved private sector performance and overall economic competitiveness. In the US for example, corporation tax is the highest in the world (40%) but business investment is far higher than in the UK. The UK already charges one of the lowest corporation tax rates in the world at 20%. Yet since the financial crisis in 2008, the UK has continued to suffer low growth in productivity, and a lack of fixed capital investment. UK businesses are already sitting on huge cash profits and a cut in taxes may incentivise firms to hold on to more profits. The chancellor’s proposal, if carried out, would see the UK join a race to the bottom, competing alongside Ireland, Russia and Eastern European countries to be the centre of a low tax, low wage, low productivity economy. A tax cut would be the government’s attempt to compensate business, especially big business, for the potential loss of easy access to the single market. But merely changing the tax rate will do little to genuinely improve the economic conditions for business. Instead, its main consequence will be a decline in the total tax take. These kinds of tax incentives can be an incentive to relocate financial operations but rarely do they result in actually operations or manufacturing moving. With limited resources at the government’s disposal it is highly debatable whether a corporation tax rate cut should be prioritised over other forms of tax incentive, that could have a more direct impact on individuals, or other spending or infrastructure priorities. The fallout from the Leave vote has thrown the UK's already vulnerable economy into serious jeopardy. It has exposed the flaws of an economic strategy reliant on financial services and high levels of private debt to sustain growth. But the answer is not to turn the UK into a tax haven. British businesses are aware of the real problems: low public investment, particularly in infrastructure and education, low public support for research and development and stagnant demand in the UK economy, triggered by austerity and the referendum’s result. As for the claim for a cheap £ being good for exports, no one can deny that. Unfortunately, the UK is a net importer. Unless the HM Revenue and Customs is taking a leaf out of the Leave campaign's handbook and lying to us or the balance of trade has shifted dramatically since April. Confidence is low in the Home Improvement system discussed back in March. Being of cautious nature, I have waited patiently for the 'logical constraint' to be triggered, and thus so far, have had just two bets, but the constraint is meant to improve an underlying profitability still further, not eliminate big losses. Over the last ten seasons (2006 to 2015), the raw system had made 47.69 points from 2,089 bets and the constrained system had made 83.76 points from a more manageable 1,017 bets. 2016 has so far been a disaster, with the raw system down 36.05 points from 116 bets. I am testing the waters with very small stakes opening with one winner on Saturday (Toronto Blue Jays) and a loser yesterday (Oakland Athletics). There is no selection today. To the Euros now, and a record setting day for France versus Iceland yesterday. No team had ever previously scored more than two goals in the first half of a Euros knock-out game and a thank you to James for pointing out that my Tweet about the team missing most penalties in a shoot-out but still winning was incorrect by a mere 1,000 years. ...then lost 3-1 in the final against the Byzantine Empire. The year 991 threw up a lot of "giant killings." but I suspect he was just being silly - the Byzantine Empire, who played under the name Byzantium (FIFA Country Code BYZ), never extended far enough for them to qualify for the CONCACAF Gold Cup! Euro Semi-Finals tend to be close affairs. 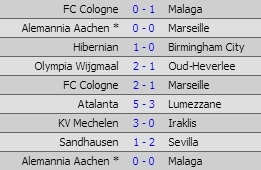 Of the last ten, six have been drawn, of which four have finished 0:0, and all-time, 50% of the 26 semi-finals have been drawn after 90 minutes. Fascinating stuff, almost as interesting as noting that only one club (Bayern Munich) has more players remaining in the Euros than Crystal Palace who have five. I am petitioning UEFA to add an additional Champions League place to recognise this achievement. It seems far more deserving than a place awarded for 'fair-play'. Interesting times, and another prominent Liar Leaver, Nigel Farage, announced today that he is standing down as UKIP leader to "spend more time with his family". His family are reportedly devastated. With all these rats deserting the good ship Brexit, one might be excused for thinking it is sinking. The criticisms do not start strong – contradicting themselves right off the bat. First saying that “Bell demands that Pregame customers trust him” about records. But then, in the next paragraph admitting that it’s true that every pick ever sold on Pregame is archived and available for review. That’s Deadspin Deception #1. We’ll be keeping count for 12 pages! ...is ostensibly true, [but] to access results older than 30 days requires clicking through a calendar, day by day, and entering CAPTCHA codes for each one. Before long you find yourself in an infinite CAPTCHA loop, unable to continue, blocked from any attempts to tabulate the hard evidence. Other 'deceptions' are petty at best. Bell suggests that his adoption of the word 'valedictorian' was because he misunderstood what the word meant after the New York Times had used it in an article about him. This may well be true, but it doesn't make RJ Bell look too smart or professional that he would make such a mistake. And I write this as someone who graduated from Primary School super fornicam. Ok RJ, pretty easy to see that you are personally pissed off and seeking to clear up the inaccuracies in the article, etc......That's great, best wishes for success with that. In the article, it's pretty clear that a great majority of every pro at Pregame is a long-term loser. And if you go by retail pricing (which is how every other business in the world is graded), just about every pro ever to give out a pick at Pregame is a net loser for their players. Haven't seen you leap to their defense yet. Haven't seen you include a single handicapper at Pregame in your lawsuit. No offense, but people that come on here to buy picks care about winning bets. They don't care about where you stood in your freakin' graduating class at Ohio State, and we certainly don't care about some Canadian media company. No deception means no deception. Where there's smoke there's fire. I have been coming on here for many years and I have no idea what any handicappers record is for any season, in any sport, for any year. NO IDEA! If you are not going to provide those numbers then I'll get them from someone else. Ryan Goldberg is the only guy that has put out all of the numbers for all of your pros. I'm inclined to believe him because he's the only one putting them out!! And ever since he put them out, they seem to be the one thing that you have not contradicted! I'll continue to come on here to gather information, thanks for that. If you can monetize that somehow, well then good for you too. Since Ryan Goldberg is the only guy to ever put out all of the numbers for the pros, and it is an awful picture indeed, then I'll continue to not buy into a losing situation and avoid buying plays at Pregame. 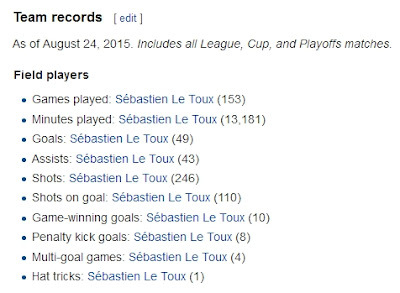 The absence of your criticism of those numbers speaks volumes. Thanks for that too. Well said. The idea that in today's connected world where information is usually immediately available, someone, somewhere, somehow has an edge on a major event that he would rather sell to you for essentially nothing rather than put his own money on the outcome, is illogical and palpable nonsense. The fact that (before Deadspin's article) long term records were in practice impossible for any Pregame.com visitor to uncover, and the general obfuscation that goes on in this industry, only served to make this point clearer. Deadspin's article on RJ Bell and Pregame isn't the first - who was it mentioned smoke and fire earlier? The Vegas Watch blog had a series called The Long Con of @RJinVegas. Part 3 - Elements of a Scam says it all really: Make it impossible for a neutral third-party to verify the long-term record of your program.